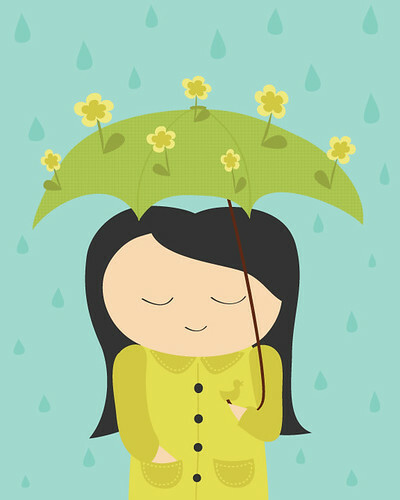 april showers may bring flowers – Hi, I'm Caroline. More doodling for your viewing pleasure! I’m really kinda proud of this one… partly inspired by my father, who said, “You should draw a little girl with an umbrella.” So, here you go, Dad. Little does she know that her umbrella has other plans aside from just sheltering her from the rain… she’s also available in the shop! Today was a beautiful day. I woke up to a sale (YAY!) and I took a long walk to work and back. It’s just warm enough that I think there may be hope for spring after all. Bring it on, I say! Now T and I are settling in with some Ben and Jerry’s to watch Pursuit of Happyness. Goodnight, dear Internets! what a happy drawing..you deserve the ice cream.. I love your little drawing. Your dad had a great idea. do you use a tablet for your illustrations? Did you draw all these pictures yourself? Great stuff and real cute! Such a cute and lovely piece! I was born in April so I’ve always felt kinda disgruntled that my birthmonth is associated with rain. This illustration makes me feel better about it.